The Angel Tree program is in its 12th year of existence. With Christmas just around the corner, many members of the Gustavus community recently took the opportunity to give back to one or more families in the St. Peter area through the annual Angel Tree program. 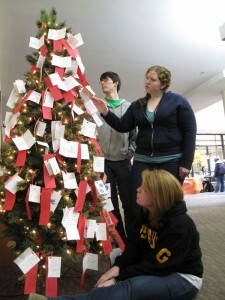 The Angel Tree is a Christmas tree that is traditionally set up in the C. Charles Jackson Campus Center. Ornaments on the tree contain gift requests for children of families in the St. Peter area who are struggling with their finances. Each year, Gustavus students and employees remove the ornaments from the tree, purchase gifts, and return them to the Peer Assistants office for distribution to the families. This year the program will provide gifts for approximately 200 children in the St. Peter community. “About 170 gifts were purchased this year and we also received about $600 in monetary donations that allowed us to go out and purchase 30 more gifts,” said Deb Reichel, administrative secretary in the College’s Alcohol and Drug Education Office. In addition to the Peer Assistants’ involvement in the program, 35 students from the Theatre Scene and Costume Shop also participated this year by collecting money and shopping for gifts that had not been purchased by students or employees. This is the 12th year of the Angel Tree program, which was started by former Peer Assistant Kate Reuer ’99.